According to Food Allergy Research and Education, an estimated 15 million Americans have food allergies, including one in every 13 children. Food allergen awareness is a safety matter that cannot be ignored by schools and institutions that offer dining facilities. In fact, colleges and universities may be legally obligated to address food allergens. In 2012, the U.S. Department of Justice said students with celiac disease and other food allergies may have a disability under the Americans with Disabilities Act. These students must be able to fully utilize a university meal plan. A food allergen is a medical condition that triggers a harmful immune response causing the immune system to attack food proteins that are normally harmless. Studies show that the “Big-8” allergens account for 90% of all allergic reactions. These eight foods are milk, eggs, peanuts, tree nuts, fish, shellfish, soy and wheat. All Big-8 foods must be clearly labeled on any processed food packaging as stated by the USA Food Allergen Labeling Act (FALCPA). Need help creating your Gluten Free/Allergen-Friendly space? Schedule a consultation with one of our experts! Although going to college “gluten-free” is becoming easier, there are still many challenges students will face. It is estimated that 1 in 133 Americans has celiac disease and 83% of them are undiagnosed or misdiagnosed with other conditions. Celiac disease is a serious autoimmune disease that is triggered by consuming gluten. There are over 300 symptoms of the disease but symptoms can vary depending on the person. Due to limited menu items, living on campus with a gluten-free diet can be extremely frustrating. It is only recently that colleges and universities have started to make gluten-free more of a priority in their dining facilities. Many schools have expanded their gluten-free menu choices with tastier offerings to help engage students who feel isolated due to their food restrictions. Click Here to See our HUBERT Brand Allergen Kits! Unfortunately gluten and allergen cross-contamination can happen at any stage of food preparation. Contamination can occur in the kitchen, during packaging or even after the food has been clearly labeled. To help minimize the risk of contamination, create a safe zone or designated area for both allergen-free and gluten-free foods. 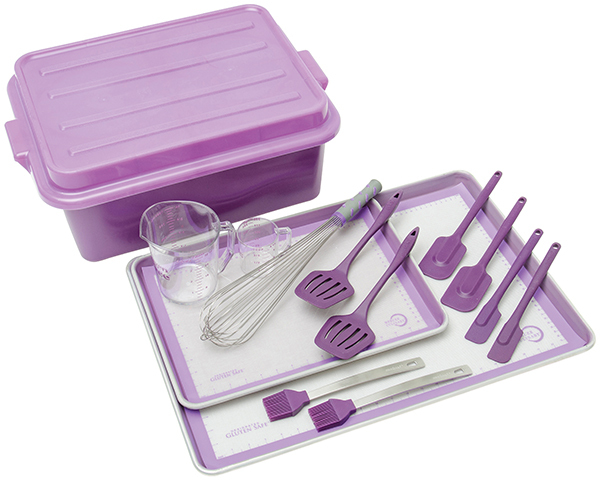 Create a visual reminder for staff and students by using purple color-coded products in the kitchen and on display. 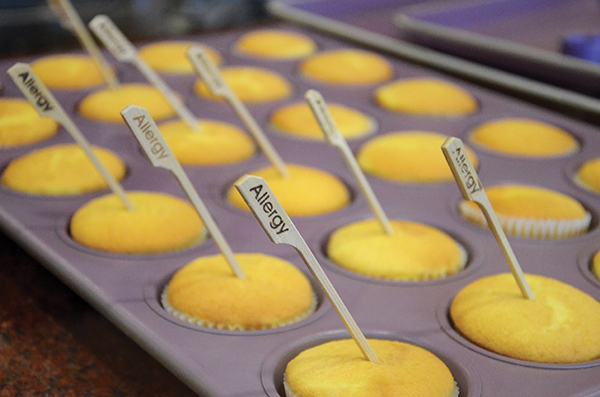 Since purple is the universal color for Allergen Awareness, Hubert has developed and manufactured our very own purple products. Our large assortment offers purple products for back-of-house food prep and cooking as well as display items to help students identify allergen-free foods. 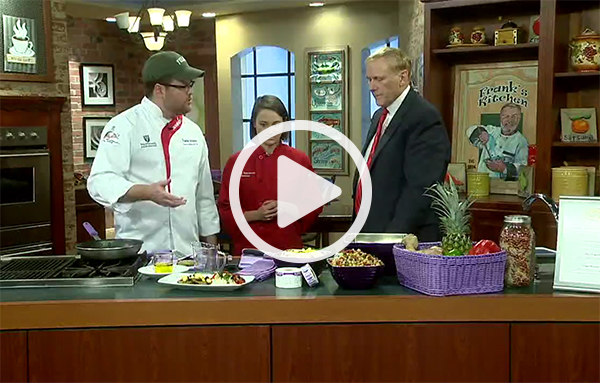 Here are some of the Allergen Awareness tools used by Tulane University in their TV news cooking segment. What tools and procedures are needed to make your kitchen and dining area compliant? Everyone from the kitchen team to the customer-facing staff needs to be trained on procedures for accommodating guests with food allergies. A menu of allergen safe foods or noting dishes that contain the eight most common allergens will help communicate with customers. Separating foods within the kitchen with color-coded products will help eliminate cross-contact. Allergen Awareness products should be washed, sanitized and stored away in a designated allergen safe area between each use. Work closely with our experienced Education Specialists to implement your ideal gluten-free/allergen-friendly zone while staying within budget!